Hope you all are having a happy and healthy life. 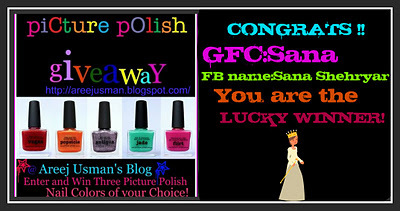 Many of you may have already know from my Facebook page that 2011 was quite a luck year for me as i won many gift hampers :D . And i was lucky enough to win a great gift hamper hosted by Areej@Areej Usman’s Blog. 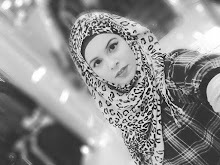 Do check her blog as she is a great blogger always honest about her opinions and reviews .You can also join Areej@Areej Usman’s Blog Facebook page or join her on Twitter. Once again , thank you so much Areej , as I truly love all the goodies in my gift hamper and manyyyyyy congratulations and best wishes for your baby boy MASHA ALLAH. I am sorry for all the delays regarding posting of my giveaway. As many of you may already know about my excitement and coping up with my very first pregnancy . Believe me baby making is not an easy job . Will soon share my detailed post about reviews and swatches of my wining goodies seperately. But for today , i am gonna publish a quick post and pics about my gifthamper. I was allowed to pick three awesome nail polishes from Picture Polish a week on your tips never on your hips amazing collection. So cute! Cant wait to see a NOTD! NANO: The Unique Gift Of Jewelry ...to die for !